Growing up there was always some kind of soapy teen drama on television. Degrassi Junior High, Beverly Hills, 90210, and to a lesser extent Saved by the Bell were all full of juicy story lines - love triangles, moral dilemmas, relationship turmoil, etc. - and it's something that 'Archie' has mastered for decades. Under all that slapstick we're still talking about a boy caught between two love interests, his crazy comedic relief best friend, and a cast of characters that sometimes get caught up in the hurricane of hijinks. It's a testament to Mark Waid's talent that his versatility brings out the teen trapped within him to write some funny and engaging scripts full of nuance, humor, and great characterizations. Any writer who can humanize Veronica Lodge is doing something magical. Not just the high-maintenance, bossy, affluent socialite of Riverdale, Veronica has insecurities and vulnerabilities like anyone else, although sometimes guarded, her feelings for Archie are genuine and endearing. This all makes Betty on the outside looking in especially after she and Jughead tried to snap Archie out of his infatuated daze with Veronica only to push Archie away further. Enter Reggie Mantle. Jughead and Betty sought his help to get between Archie and Veronica but didn't go anywhere. Undeterred, Reggie is determined to complete his mission. Reggie, the jealous prankster, tries his best to get in with Veronica but fails spectacularly. Next, he tries to be in her powerful dad's circle of influence and that goes wrong real fast. Reggie is no quitter and by the end he uncovers some information that will change things going forward for our heroes. Waid cleverly orchestrates Reggie's epiphany conveniently but it was born out of an important scene with Veronica and her therapist. Veronica is complex, more so than I ever thought she'd be, and the reveal of the many layers of her personality just galvanizes 'Archie' as more than just campy fodder but one of comics great teen dramas. Betty is wrought with guilt after she unknowingly hits Archie on the head with a huge home run during her softball practice that once again reveals the humanity of the characters.It sends him to the hospital with a concussion and Archie's mom consoling Betty is such a heartwarming touch that feels authentic and appropriate. Another Veronica, Veronica Fish, is the regular artist on 'Archie' now and she continues to shine with the same kind of versatility in art that Waid has with storytelling. She plays up some of the lighter comedic moments with effusive facial expressions, especially a livid Hiram Lodge or a surprised Reggie, but the quieter moments like a somber Betty and Jughead waiting at the hospital are just as impactful. Her sharper lines differ from Fiona Staples, who drew the first three issues, but no less beautiful. The layouts are dynamic and choreographed well. The scenes with Reggie require some energy as he sits poolside with Mr. Lodge and she finds angles that keep the eyes moving and the perspectives change to keep you engaged. It's a simple scene that exposes Reggie's insignificance to Veronica's dad and it's well-crafted so it works to perfection. 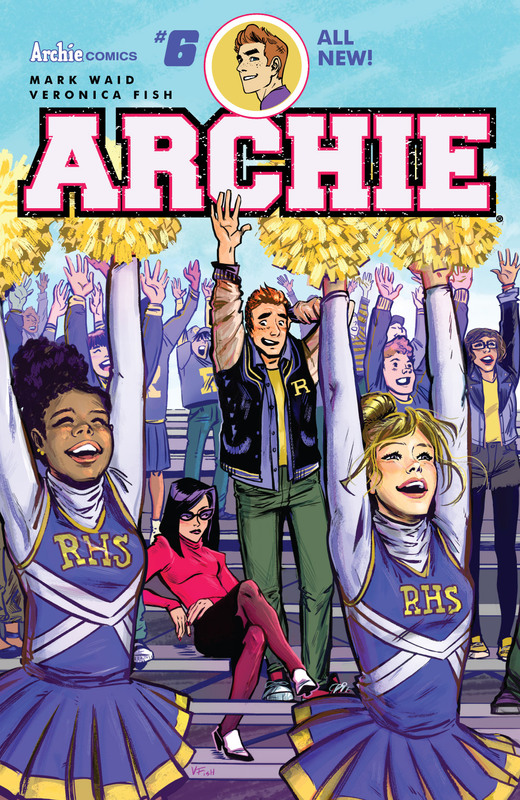 'Archie' by Waid and Fish is so ripe with fun and drama that it makes sense that the CW Network is producing a live-action series, Riverdale, with these characters. The next great teen drama has always been with us and it continues in this fantastic new series that captures the whimsy of the past with greater depth and real emotions. Waid and Fish have broken the mold of whatever goofy image Archie may had had before. 'Archie' is a legitimate winner on every level that is funny and compelling without an ounce of snark or cynicism.